Then you need to get yourself and some sort of valuable item to a pawn shop, stat! Pawning is an age-old tradition where you can trade something you own for a short term loan, or get rid of it entirely. Want to know more about how it works? Sell yourself on the tips below! If you’ve never been in a Pawn shop and all you know about them is what you’ve seen on TV, don’t worry – we’ve got you. Pawn shops are like very unique resale stores, in that they’ll give you a loan for very specific collateral. Let’s say that you need $200 to get through the week and you’re getting paid on Monday. You can go to a pawn shop and bring them an item worth what you need in cash. That would probably be a laptop or jewelry, for that amount. They’ll ask you if you’d like to pawn or sell – to which you’d respond pawn (in this example). They’ll draw up a contract that says you get cash in exchange for your item for this amount of time. If you don’t return to pay the loan back, then they get to keep the item you pawned them. Think of them like small secured loans you can process at your local strip mall. If you return within the agreed upon period of time, you pay back your loan and you get your item back. If you’re late – you may still be able to get the item back, but you never know. It’ll have transferred to the pawn shop’s ownership by then and you’ll have to buy it back. Now, you’re not just going to walk in, shake hands, hand over your item, and get cash. There are paperwork and financial details you need to understand. Even your pawn loan has interest, but it shouldn’t incur very much if the term of the loan is short. But the longer the loan period is, the more you’ll pay. Imagine something around a 3% interest charge per month. It’s hard to say what you’ll pay. The charges and regulations vary from state to state, so make sure you read your paperwork. You can ask or quickly google what your state’s pawn shop regulations are to make sure you’re getting a good deal. If you just want to get rid of an item and don’t want to mess around with meeting up with someone from an app, go to a pawn shop. They’ll buy things off of you, with no loans required. Now – you may not always think the price they give you is fair and this is one place in America you’re allowed to haggle. Start high, but don’t be excessive. You don’t want them to think you’re unreasonable. So if you want to get $200 for a watch, start at $350 and let them counter offer. If they tell you something is the highest they’ll go, try for $50 more than that. If they say no, that means no. You need to take or leave the offer – and the item. Once you establish what you’d like to do at the pawn shop, they’re going to look over and assess your item. At this point, they’ll also ask you a series of questions to find out if you own it or not. This isn’t a question of character. There are people who steal things and pawn them for cash, enough that pawn shops need to ask questions before products change hands. Assuming you didn’t steal it, you can relax. Just answer the questions honestly and to the best of your ability. You don’t have to remember the exact day and time you bought the item – but put a little effort into your answers. Once ownership is established, you’ll also be asked for your ID. 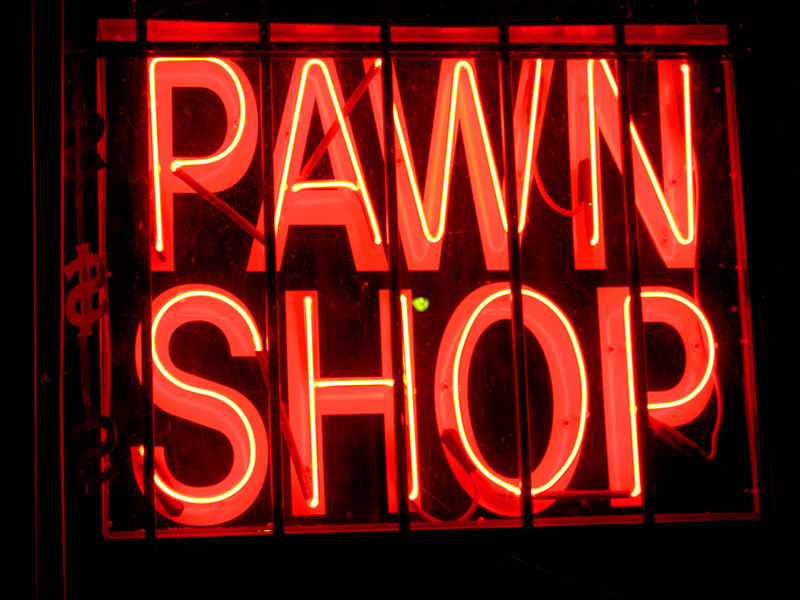 Pawn shops have to keep records of what’s taken in and pawned out for their sake. Your ID will act as your client profile, of sorts. It needs to be a government issued and approved ID, so leave your school ID card at home. The most important thing you need to know is that the pawn ticket or receipt you get at your transaction isn’t replaceable. You need to treat it like cash, or like gold. This ticket has the terms of your loan or your purchase on it and should be kept in a safe place. While we love the show Pawn Stars, you don’t have to have something unique and insane to take to a pawn shop. As long as it’s in sellable condition and you own it. you can take it in. If it’s something really out of date, you may not want to bother. No one’s interested in a run-of-the-mill VCR from 1993. Keep the resale value in mind, from the point of the shop owner. On the other hand, things like silver coins will always sell. While the sale or loan is up to the pawn broker’s personal decision, use common sense and you’ll be fine. Finally, let’s talk about getting your item back. If you did pawn something and can pay back your loan, great. Show up to the shop with your pawn ticket and the amount of cash you owe. You’ll sign another set of papers (or another line on the same pawning one from before) saying that the transaction is complete. Ta-da! You’ve now successfully pawned an item. What will you do next?